On 26th January, SWOP attended Yabun Festival, the largest one-day gathering and recognition of Aboriginal and Torres Strait Islander cultures in Australia, held each year upon the traditional lands of the Gadigal people in Sydney. The festival offers a range of food and entertainment, a marketplace of jewellery, arts and crafts, and other merchandise, and panel discussions and community forums on Aboriginal issues. This year, SWOP’s red umbrella was near the main stage, so we were ideally place to enjoy the live music performances. Having a stall at festivals is a great opportunity for us to talk about what we do with people who we may not normally meet, and SWOP staff often have memorable and interesting interactions with visitors. It is also a great day to meet with other organisations, and learn about how we serve our respective communities. 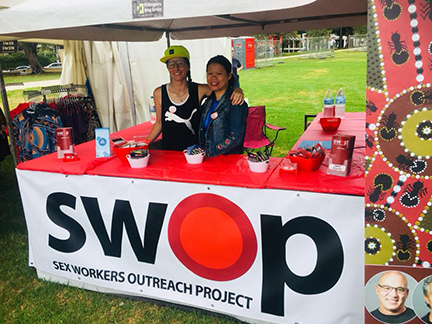 SWOP congratulates the organisers of Yabun 2018 on another memorable and well-organised day. We hope to see you at Yabun Festival in 2019.